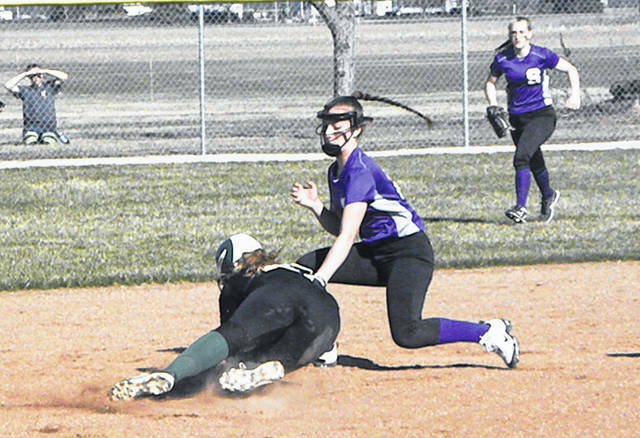 Sara Myers of Evergreen slides into third during the NWOAL softball opener with Swanton Monday. The Vikings defeated the Bulldogs by a score of 12-5. Kailey Brownfield of Swanton tags out Evergreen’s Myra Kuszmaul during Monday’s game. 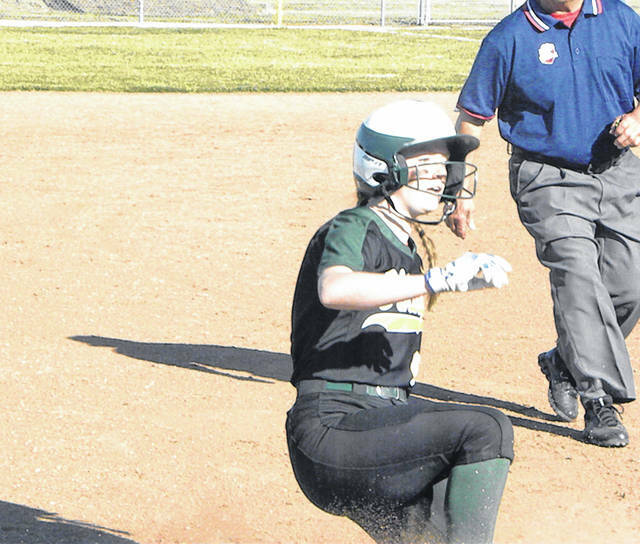 Opening day of the Northwest Ohio Athletic League softball race is so important to come out hot and Evergreen did just that, using a big second inning to take a big lead and added on from there to score a 12-5 home win over Swanton Monday. The Bulldogs jumped up 1-0 in the first when Kylie Ulch rocketed a long home run over the right center field fence off Courtney Couts, giving Swanton a 1-0 lead. However, in the second Evergreen came up big against Swanton’s Alexis Bergman. Kennedy Keller lined a single to left and scored on Breanna Huffman’s double to center to knot the game 1-1. An error on Riley Lumbrezer’s ground ball scored Huffman and gave Evergreen the lead for good. After Sara Myers’ line drive single, Kelsie Komisarek’s double to center marked a third run. Myra Kuszmaul capped the five-run burst with a two-run double to right. Singles from Lumbrezer and Myers along with a passed ball added a run in the third, and Komisarek’s steal of home tacked on another to make it 7-1. Couts struggled in the fourth walking three straight Bulldogs but got out of the inning allowing just one run on a fielder’s choice. Evergreen answered back as singles from Keller and Huffman coupled with a pair of Swanton errors doubled up the Bulldog tally to give the Vikes a 9-2 lead. A Viking boot and Jessica Dohm’s RBI single plated a run in the fifth but Evergreen put the game away in the bottom of the inning, scoring three times. Singles from Andrea Smithmyer and Couts, a walk, a fielder’s choice and Huffman’s line drive double to center gave Evergreen a 12-3 lead. Smithmyer went 4 for 4 to lead the Viking offense, while Myers and Huffman each had three hits. On the mound Couts gave up just four hits and two earned runs, striking out 11 in gaining the win. The Vikings host Bowling Green in a doubleheader Saturday before returning to league play Monday with Archbold coming in. Swanton hosts Bryan Monday in NWOAL play.